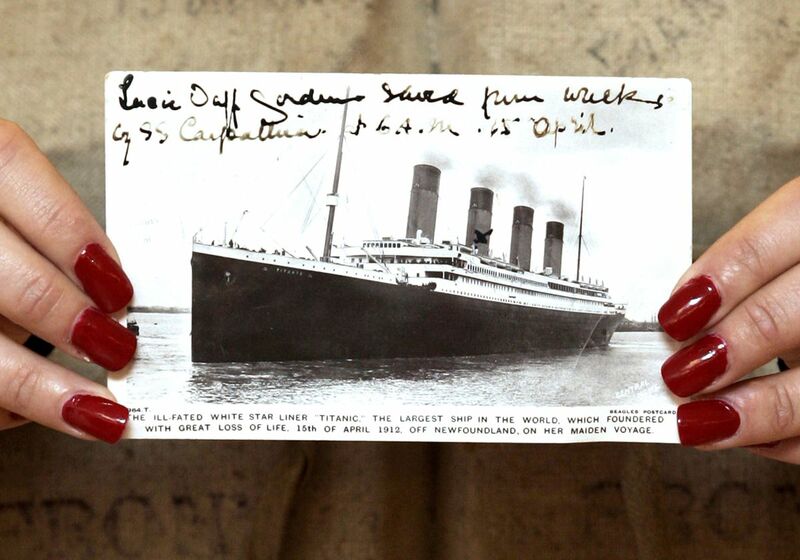 A postcard of the Titanic displayed at Christie's in London in 2007. Bloomberg photo by Michael Crabtree. But the company holding the rights to the ship and 5,500 artifacts has been mired in debt, placing the future of its collection in the hands of a bankruptcy court. On Thursday, a judge weighed plans for auctioning the largest trove of Titanic memorabilia, which already is drawing the interest of U.S. hedge funds, Chinese investors, British museums and award-winning filmmaker James Cameron. Among the items are the bell a crow's nest lookout rang to warn the bridge of an iceberg ahead; window grills from the first-class dining area; a passenger's three-diamond ring; and a suitcase full of clothes owned by William Henry Allen, an English toolmaker immigrating to America. Titanic, once the biggest ocean liner ever built, sank almost two miles below the sea on its maiden voyage in 1912, killing more than 1,500 of its 2,200 passengers. "It's just sad to see that great ship of dreams, and the pieces of it, bounced around like an orphaned child,'' said David Gallo, an oceanographer and former head of special projects at the Woods Hole Oceanographic Institution who co-led an expedition to the wreck in 2010. At least three groups are vying for the artifacts from the current owner, Premier Exhibitions Inc. It's the successor to a company once owned by a wealthy Connecticut auto dealer, who bankrolled a French exhibition that retrieved artifacts from Titanic for the first time in 1987. The wreck was discovered two years earlier by oceanographer Robert Ballard, who refused to remove anything from the underwater site. But expansion left the company with more debt than it could handle. Four years ago, Premier sought to raise cash by selling Titanic items and rights to future salvage from the underwater site. It valued all the assets at $189 million, but the plan fizzled when no one was willing to pay that much, because legal covenants required the collection to be kept intact. "At the time, we had many inquiries by people hoping to acquire one thing or a few things, but it wasn't an option,'' Arlan Ettinger, president of Guernsey's auction house, said in an interview. Buying the items also obligated the owner to safeguard the wreck site, which proved "too much for any one buyer to agree to," he said. Premier filed for bankruptcy in 2016. A judge reviewed possible auction plans at a hearing Thursday in Jacksonville, Florida. There are signs that Titanic aficionados would be eager to own individual items. Over the years, some artifacts have been sold that were retrieved by survivors and weren't part of the Premier collection. A violin recovered from the body of the Titanic's band leader fetched more than $1.45 million. A fur coat donned by a crew member to combat the harsh Atlantic cold on that fateful April night brought $235,000. A key to the crow's nest sold for $145,000, and a cracker from a survival kit went for $23,000. Rather than sell items piecemeal, Premier's chief executive officer and biggest shareholder, Daoping Bao, has proposed a plan backed by a bevy of investment funds and Chinese businessmen who have bought $2 million of the company's debt. Among Bao's backers are Hong Kong-based PacBridge Capital Partners Ltd. and U.S.-based Apollo Global Management. Premier also hired Gallo, the oceanographer, as a paid consultant. Bao's group pledged to keep the collection intact and within reach of U.S. courts while planning to ramp up scientific and tourist expeditions to the wreck. Paul Burns, vice president and curator of the Titanic-themed museums in Branson, Missouri, and Pigeon Forge, Tennessee, said in an interview Thursday in Jacksonville that his organization had tried to acquire the Premier artifacts last year, offering between $5 million and $10 million, but had been turned down. "We'd like to buy it so we can display it in the U.S.," Burns said, adding that a successful bid by Bao could raise questions about foreign ownership and a review by the U.S. government. Giovanni Wong, PacBridge's managing partner, declined to comment outside the Jacksonville bankruptcy court. During the hearing Thursday, an attorney representing minority shareholders asked Gilbert Lee, a partner at Alta Fundamental Advisers, whether the Bao group would ever break up the collection. "Anything's possible," Lee said. At the hearing, Bao's group raised its bid for the assets to $19.5 million from $17.5 million, and said it put down a cash deposit. That tops an offer of $19.2 million from a third bidding group, which includes some British museums backed by Cameron, the filmmaker whose 1997 disaster/love story "Titanic" racked up more than $2 billion in box-office sales. The Washington-based National Geographic Society pledged $500,000 to help fund the museum bid. "We could ensure that no further objects are raised from the wreck site and thus protect the site for all time," Kevin Fewster, director of the Royal Museums Greenwich, said in an emailed response to questions.